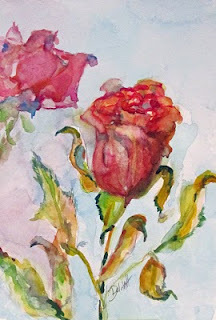 I work on this painting first in watercolors which can be seen on blog Art on Paper. 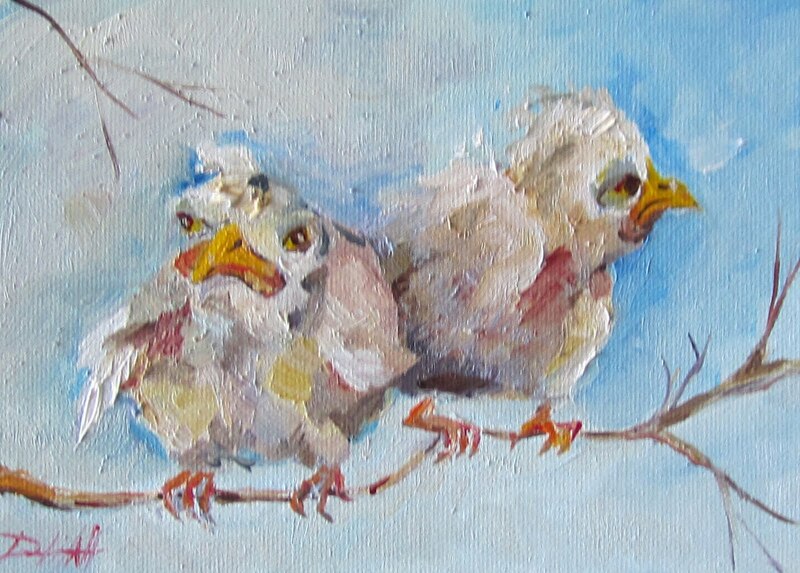 The I started this painting in oils. I think I will try another one. I like the brush work but would like to try an underpainting for more contrast next time. 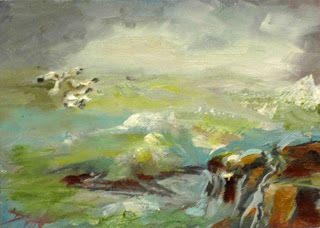 About This Painting: This small seascape daily painting show the breaking waves and sea gulls trying to fight the wind as a storm comes inland with crashing breakers. 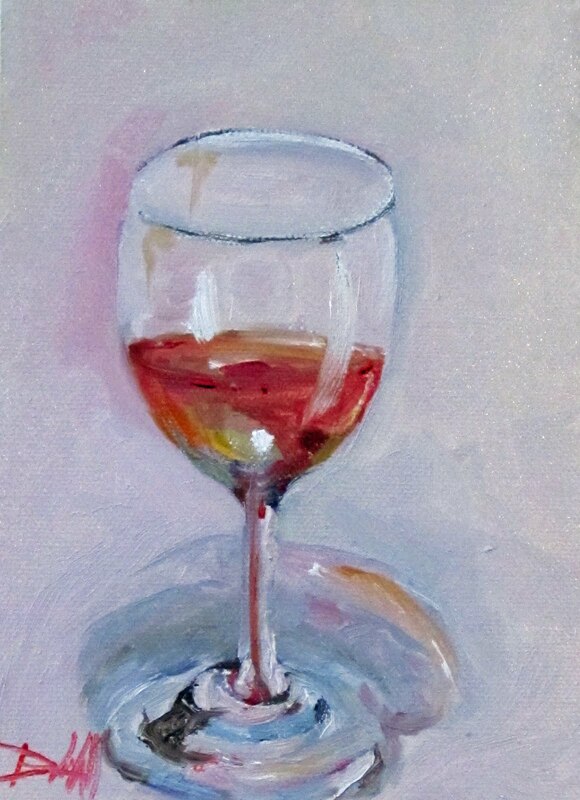 The challenge: Paint this image using only burnt sienna, ultramarine blue and titanium white. That's it. No other colors. 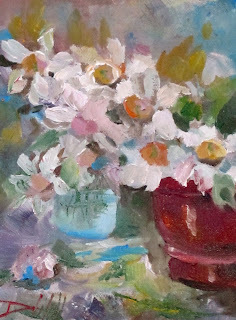 With that combo you can have it look pretty darn close to a full color painting by achieving a wide array of values and temperatures. 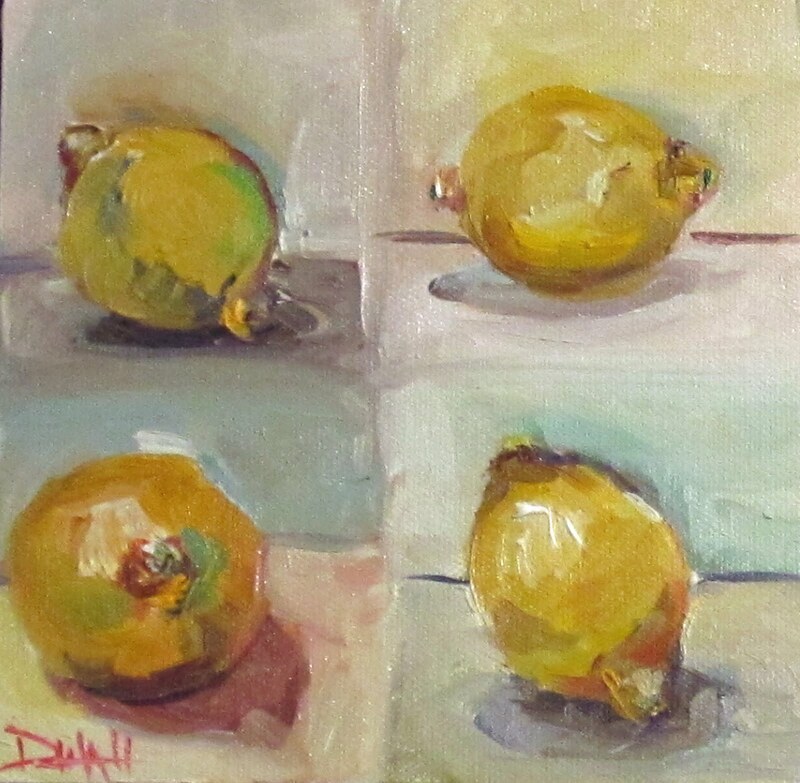 Every DPW (Daily Paintworks) a group of wonderful daily painters has a challenge and anyone can give it a try. The fun part is all the paintings are post on their blog for all to see. 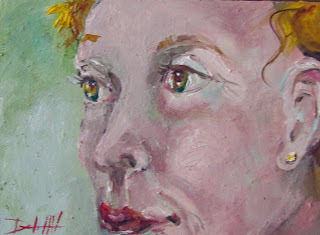 Most of the paintings are for sale. 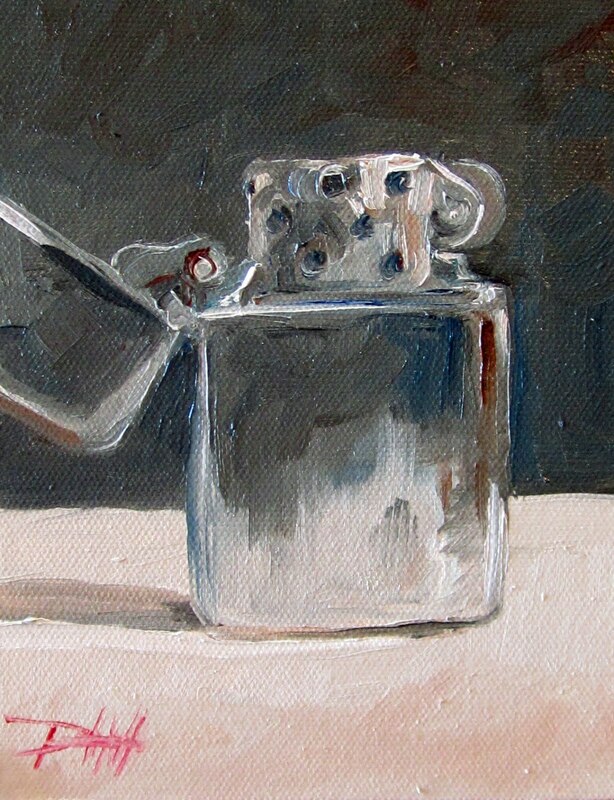 If you would like to see what has been posted for the Zippo Challenge click here. 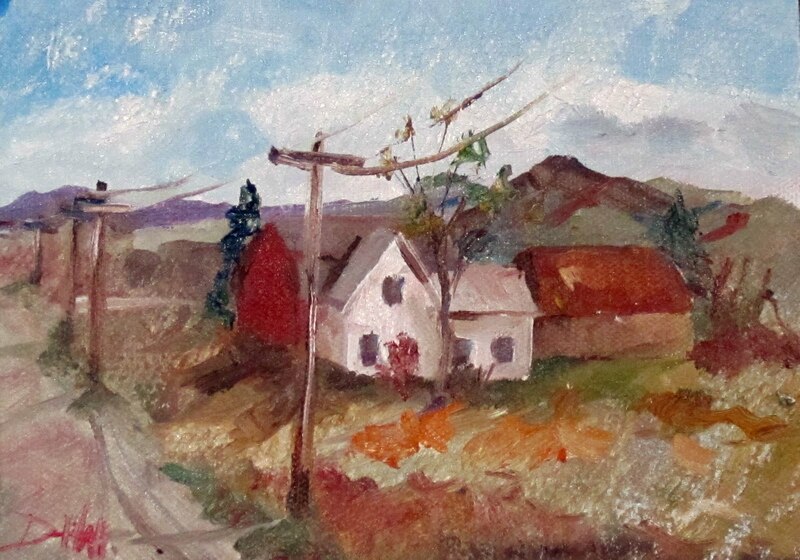 Michael Naples, a great daily painter, posted this weeks challenge. 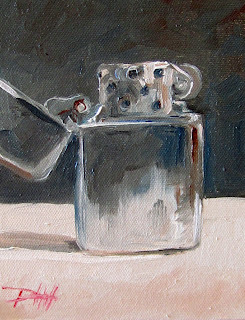 There are over 100 zippo lighter posted so stop in a take a look. 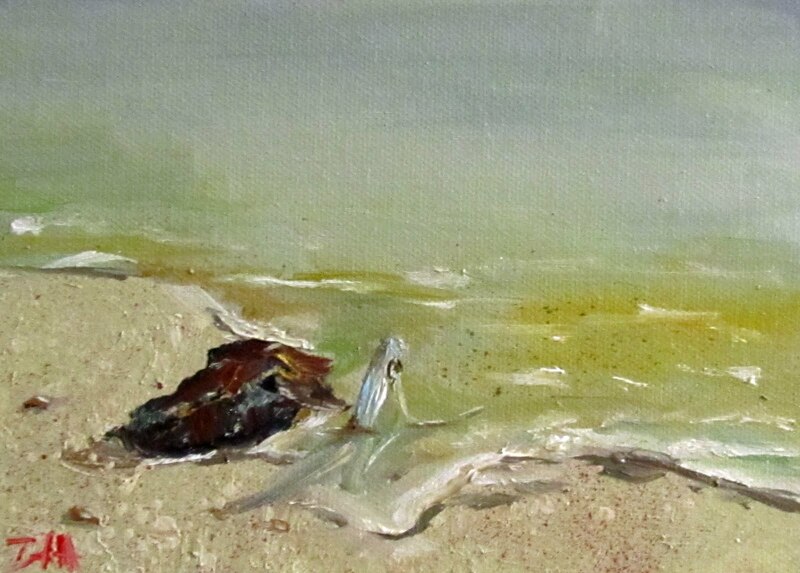 I painted this earlier this week at the beach. 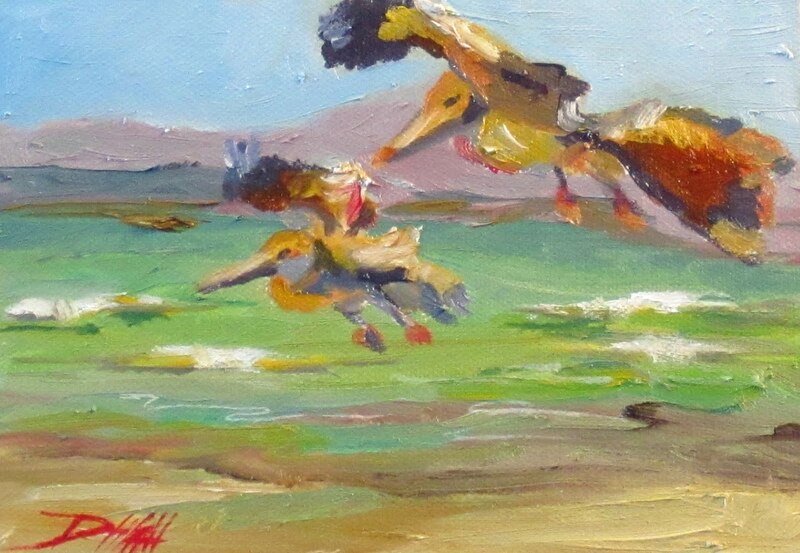 I have decised that my plien air paintings this year will be 8x10. I have a nice Plien Air cigar box that is just right for 8x10. 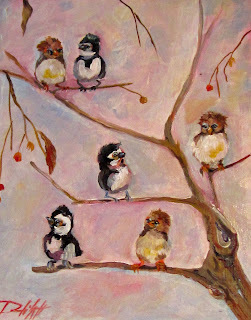 Another painting in my chubby birds series. These little guys are sitting out on a limb trying to decide which way to fly. 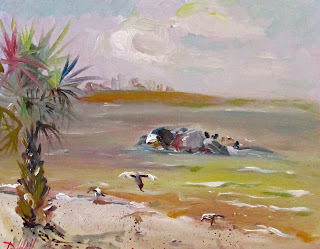 I was out plien air painting today at Suunset park in Tarpon Springs. 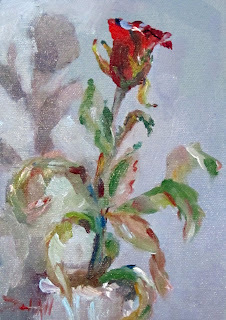 My rose from Valentines Day is still nice so I am painting it until the petals fall off. I have been keeping it in the refrigerator. 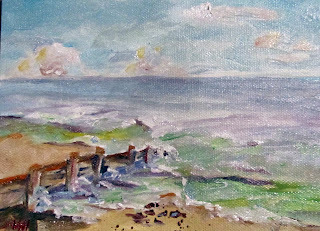 Today I went to Duneden and painted with a group of plien air artist from Tarpon Springs Fl. It was a perfect thing to do, visite the green market in Dunedin Fl. The green market, brussel sprouts,leeks,radish, and all kinds of Fl fruit. Wonderful things to ear and great things to paint. 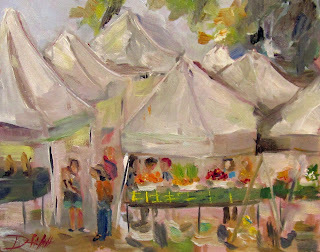 There were lots of fun tents and colorful fruits and vegetable. The smells were wonderful, it was hard to think about painting with the great music and all the people walking around the market. A wonderful collection of booths and shoppers. Spring is in the air. I had to paint a few spring flowers, Tomorrow I will be plien air painting in Dunedin Fl . 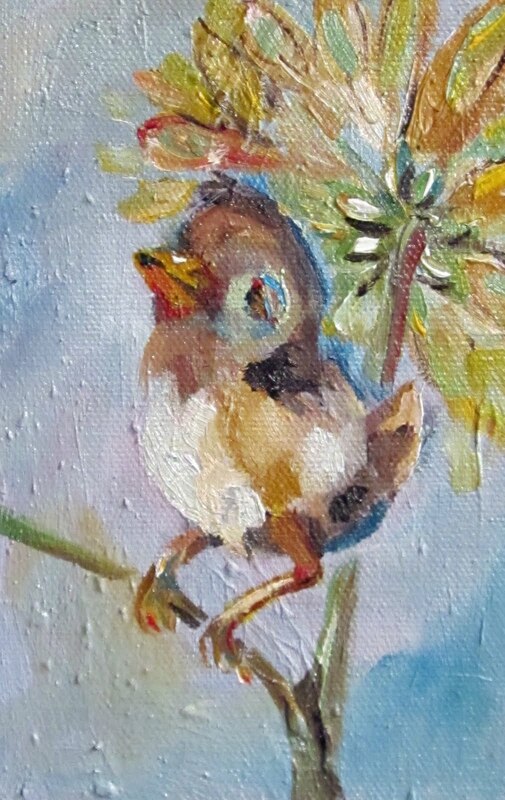 I will post the painting as soon as I get back. 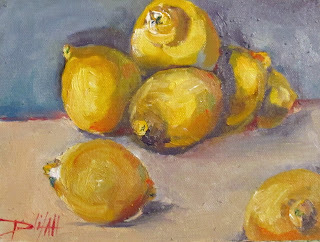 It is suppose to be in the 80's so I should have lot's of sunshine and a happy painting day. 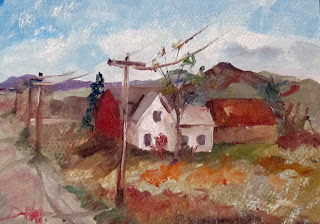 /div>"post your opinion in the comments" or email me at delilah@artbydelilah.com,,Thank You:Visit my web site Art by Delilah http://www.artbydelilah.comDelilah Smith" Daily Painter"
Rural Landscape is an oil painting that is 5x7. I will be doing some plien air painting this week. 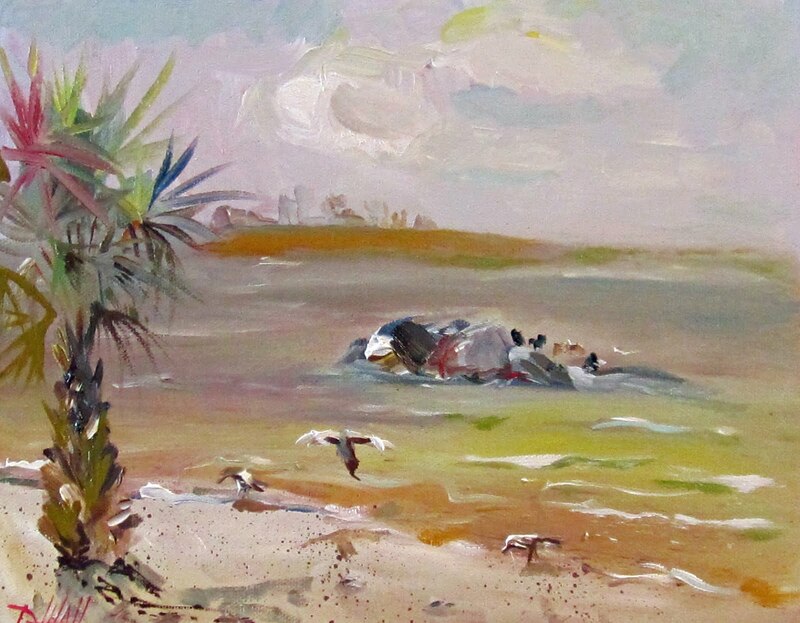 They will be the first tropical landscape painting of the season. 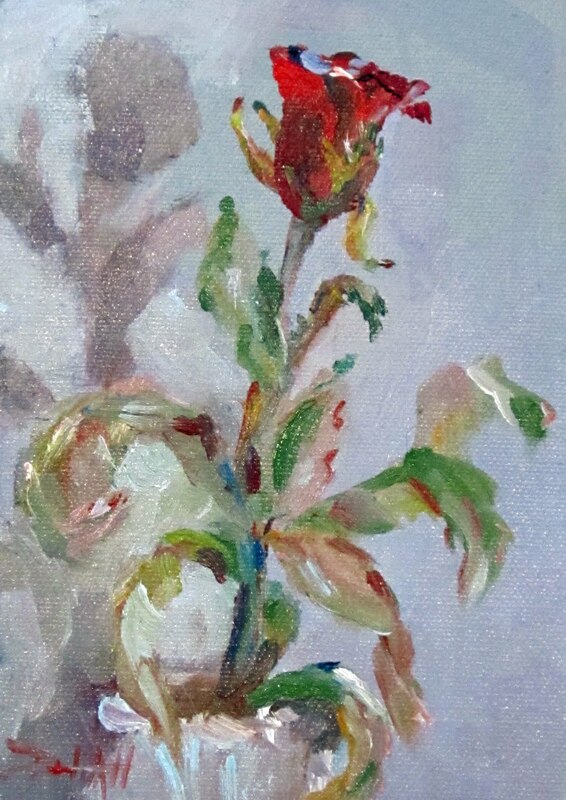 Painting roses is hard, There is no room for overwork, and every brush stroke needs be right. On the other hand, painting roses is easy. You only need few strokes, and you don't have to follow the setup exactly. Well, this will happen after you have painted many of them. After a nice dirt bath these chicken are looking for an afternoon snack. 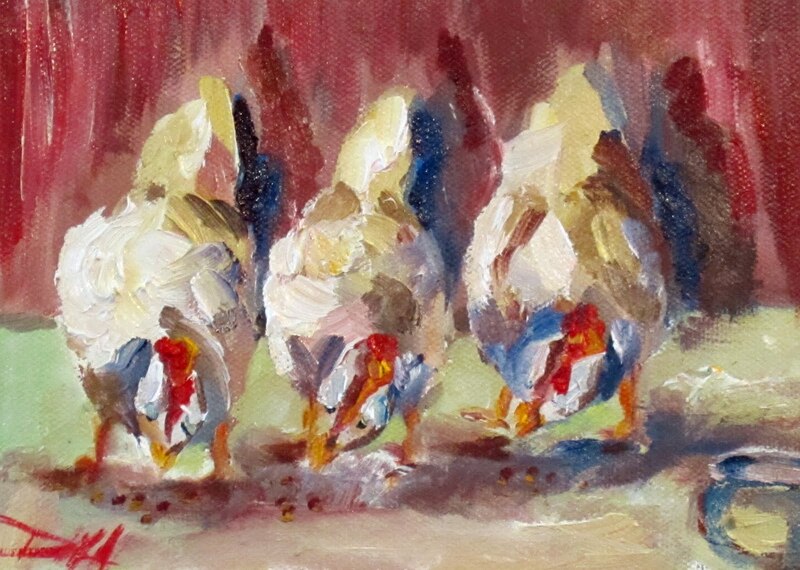 Chickens sometimes segregate into groups of like feather colors while foraging for lunch. I wonder if they organize by color just for me? 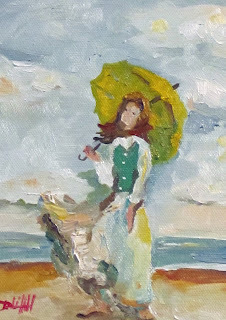 5x7 oil painting on canvas mount on a museum quality panel ready to frame. 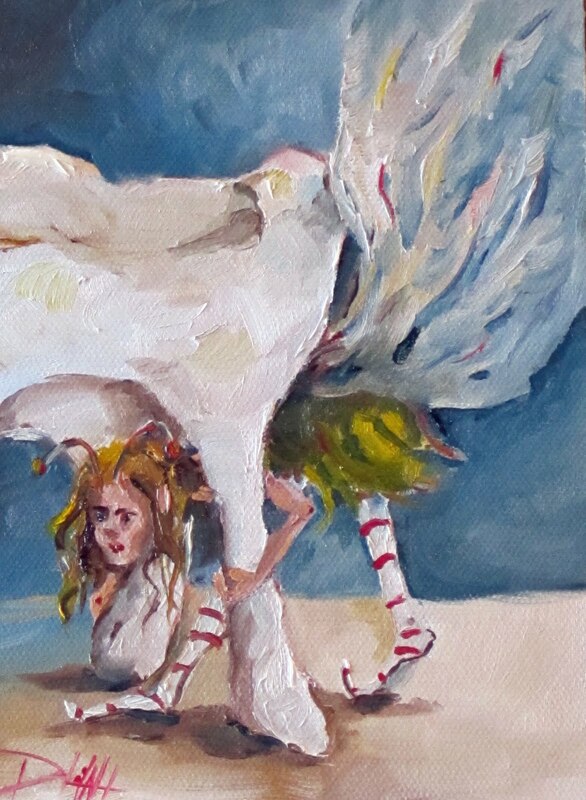 This week I saw the movie "The Black Swan" so my mind is now thinking ballet all day long. Twirling with memories of the movie. 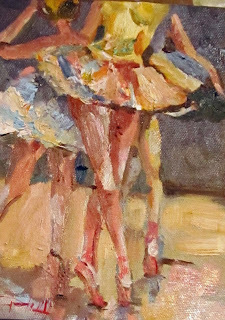 I think of ballerienas ,of Degas, of long days of hard practice, 0f artist trying to capture the experience. I once read that you should surround yourself with the type of people you would like to be like, because it really does rub off. I think as artist we should expose ourselves to as much motivational and artistic stimulus as possible because I am sure some of it will rub off. 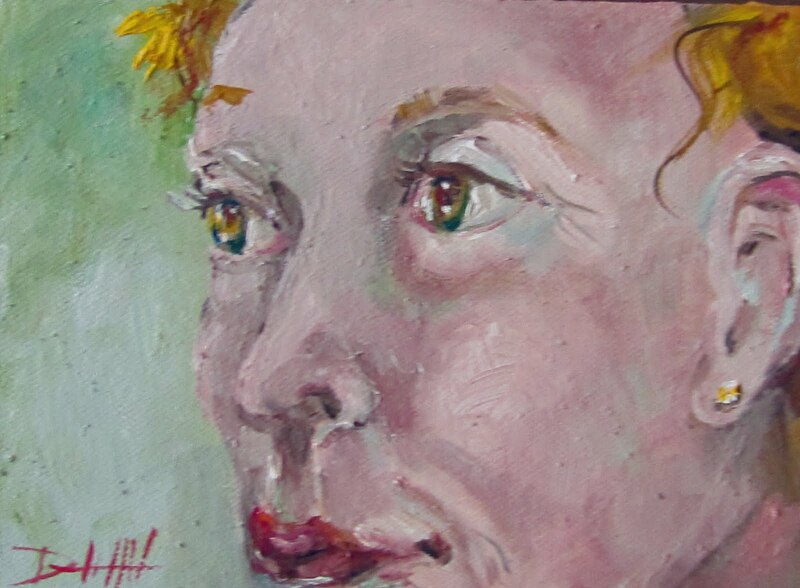 When I speak of " artistic stimulus, I am not speaking of a cash influx by the government but to physically seeing as many great works of art, and successful artist and galleries as we can possible see.I think it gives me direction. My environment changes my perception. It influences who I am,that is why I have choosen to be an artist. It is also the way that I personally motivate myself so I choose a rich environment filled with color ,change,eclectic friends and this week choreography of the ballet. The rules: Get a timer. 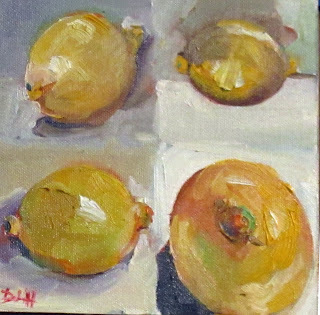 Divide your canvas or canvases (I used 2 - 6x6in Raymar canvases) into 8 or so small squares (or rectangles). They should be smallish – a couple or 3 inches square or thereabouts – they don’t have to be perfect. Now choose ONE object. Just one. Set your timer for 10 minutes. Paint your object in the first square. When the timer goes off – stop! I mean it. Repeat until you are done. You can rotate your object and/or change the light for each new square. 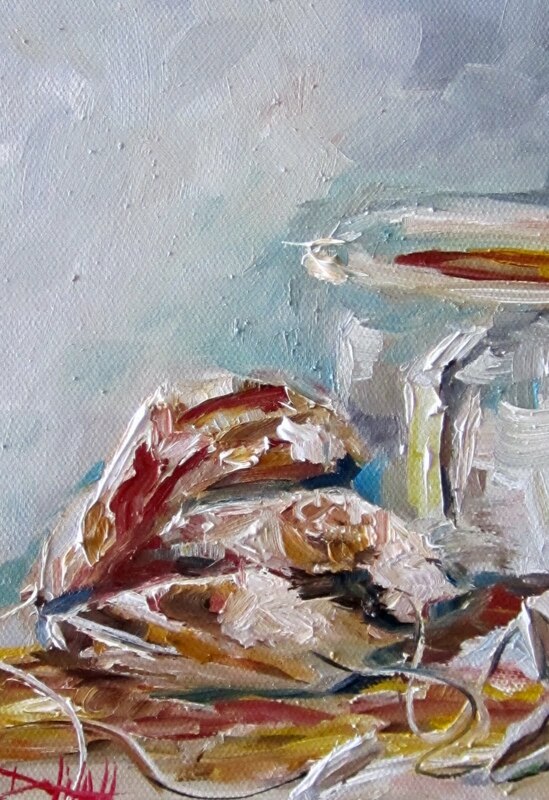 The objective: You want to get a feel for your object in terms of brush strokes. Make sure you SQUINT and SIMPLIFY! Whatever you do, DON’T get bogged down by the details or you’ll never finish. 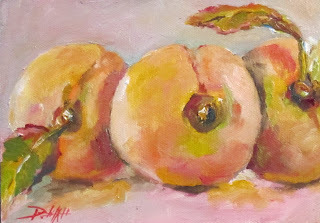 Try to think of it NOT as an apple (or whatever you’ve chosen) but rather just shapes and colors and values. Paint what you see – not what you THINK you see. If you find yourself doing the same thing every time – experiment! You won’t learn unless you try something different. Expect the first one to be bad – you are getting a feel for just how long 10 minutes is. They will only get better. I can’t wait to see how you guys do on this one!! This is a study painted on TWO 6x6 canvas paintings. All Art is self portrait. 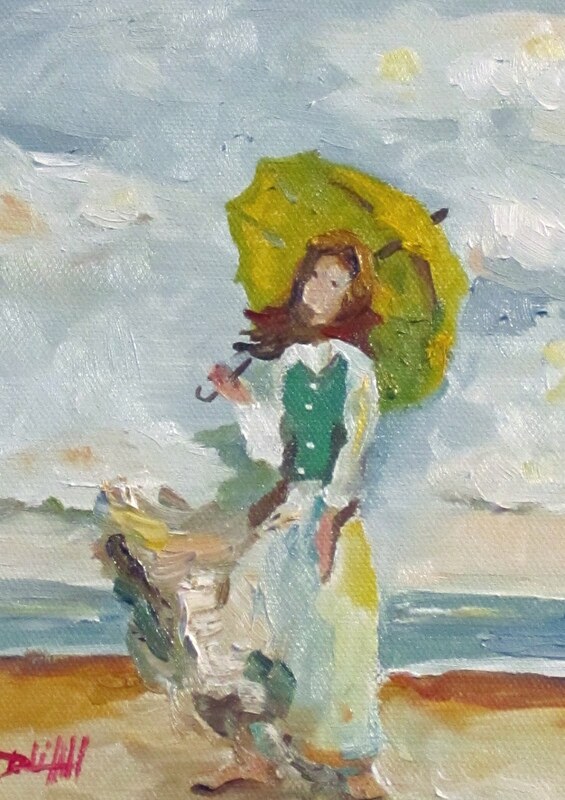 a="">"post your opinion in the comments" or email me at delilah@artbydelilah.com,,Thank You:Visit my web site Art by Delilah http://www.artbydelilah.comDelilah Smith" Daily Painter"
I am in Florida right now so I will be painting more seascapes and tropical landscape. 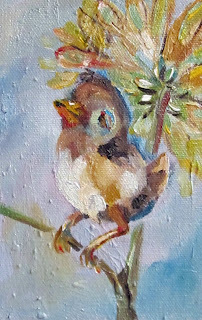 It has rained for the last few days so I have not been able to get out and plien air paint but I am right on the bay and see lots of birds from my deck.The studio cats love to sit and watch them their tails twitch with happiness at seeing and hearing the birds. When I started this painting I decided on a soft muted color palette. First I drew the landscape and horse in burnt sianna. 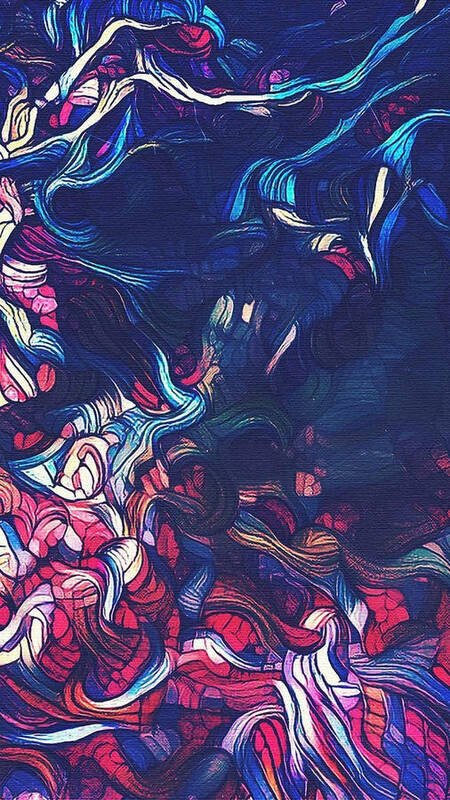 I used a lavender mixed from phthahlo blue and alzarian crimson. I kept very soft edges on the landscape because I wanted to use hard edges on the horse. 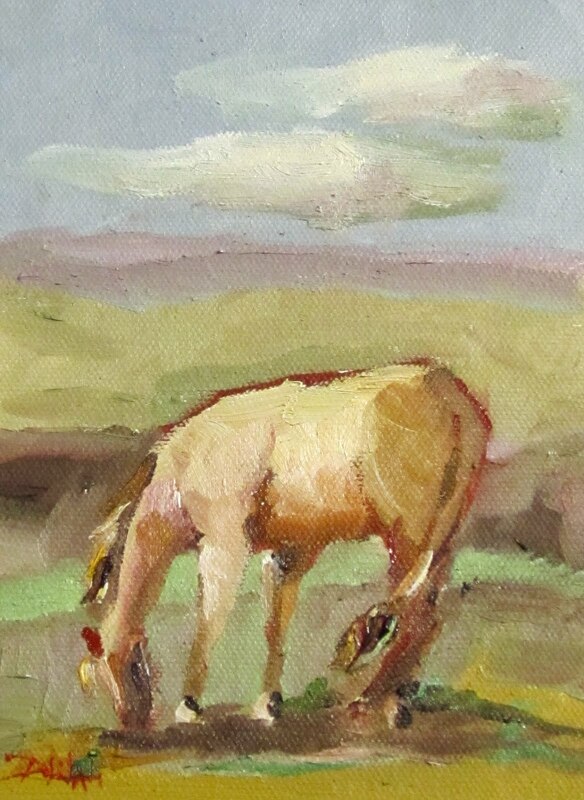 I painted the shadows on the horse first with shades of burnt umber, The last details were the shadow under the horse and the high lights on the tail. 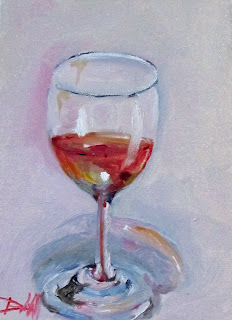 7x5 oil on canvas mounted on hardboard ready to frame. 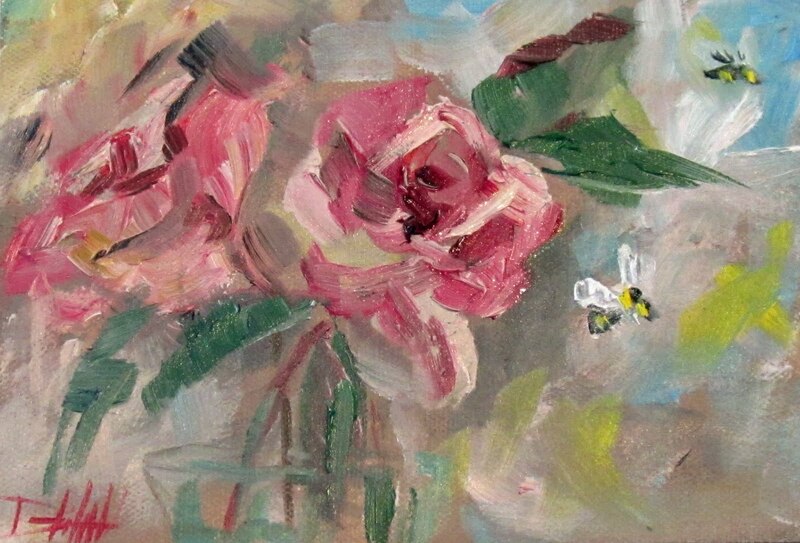 This painting is sold unframed. 5x7 oil painting on canvas mounted on a museum quality panel ready t be framed. 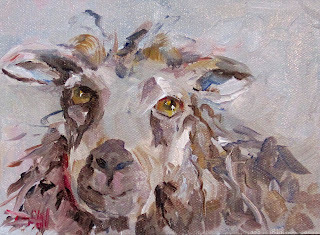 This painting is sold unframed. I decided to get a little romantic with this daily painting, after all it is February and almost Valentines Days so a walk on the beach seems just the right place to find romance. 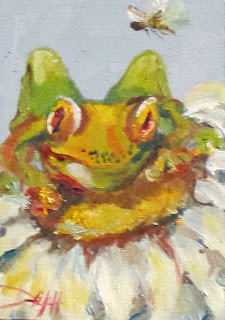 A few months ago I painted a small watercolor aceo like this and I like the whimsical nature of the frog and the bee so I thought I would try it a little larger. 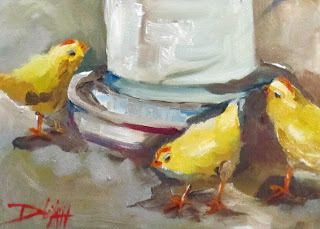 Growing up on a Michigan farm baby chicks were a part of the farm animal menagerie of everyday life. My mother took care of the egg business. Every spring we would get a new box of Peeps. My mom would put a fruit jar fitted with a watering cap in the box and a light bulb over it to keep them toasty warm.Poultry brooders were the home made kind back then. 5x7 oil painting on canvas mounted on a museum quality panel. This painting is sold unframed. 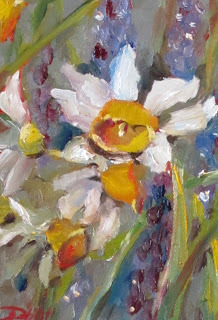 I have a little spring fever today so I decided to hurry it along with a painting of spring flowers.Spring is always s green with narcissus and cheerful grape hyacinths the combination seems to scream spring is here. If you do not have any spring flowers in your garden Michigan Bulb growers have fabulous ones that you can buy. 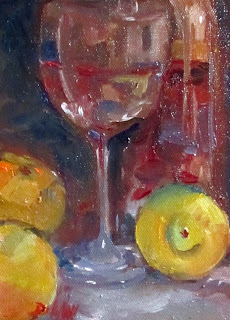 7x5 oil painting on canvas mounted on a museum quality panel. This painting is ready to be framed. Final Inspection by the tooth fairy before she takes her new prize. I keep adding paintings to my Fantasy Fairies series these little whimsical creatures with the red and white socks are always up to something.